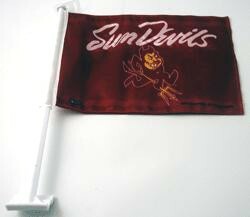 These licensed Arizona State Sun Devils car flags are made of durable, knitted polyester and are double sided for longer life. Supply your home town sports fans with the car flag of their favorite team. Dimensions: Flag-15"x11", Staff-20"L, Clip-3"W.